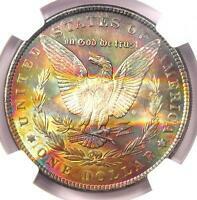 1880-S Toned Morgan Silver Dollar $1 - NGC MS63 - Nice Rainbow Toning! 1880-S Toned Morgan Silver Dollar $1 - PCGS MS63 - Nice Rainbow Toning! 1887 Toned Morgan Silver Dollar $1 - Certified NGC MS63 - Nice Rainbow Toning!